"Flavia de Luce, a dangerously smart eleven-year-old with a passion for chemistry and a genius for solving murders, thinks that her days of crime-solving in the bucolic English hamlet of Bishop's Lacey are over–until beloved puppeteer Rupert Porson has his own strings sizzled in an unfortunate rendezvous with electricity. But who'd do such a thing and why? Does the madwoman who lives in Gibbet Wood know more than she's letting on? What about Porson's charming but erratic assistant? All clues point toward a suspicious death years earlier and a case the local constables can't solve–without Flavia's help. But in getting so close to who's secretly pulling the strings of this dance of death, has our precocious heroine finally gotten in way over her head?" It took me way too long to read The Weed That Strings the Hangman's Bag. Just way, way too long. A big chunk of March stood lazily strolling through its pages. I've thought about why over a thousand times and came up with the conclusion that I was distracted, without fuss, by outside influences pulling my attention. Now I don't want to call the second book in Alan Bradley’s Flavia de Luce mystery series boring. No, I won't proclaim that. I wouldn't even dare, as I adore Flavia enough as it is. However, I suppose I just wasn't as invested in the mystery's unfolding–or the mystery itself. Toward the end I found it mostly unbelievable, or rather a stretch to believe. (Of course I can't give any details without spoiling it.) However, I also though The Weed was more heart wrenching than its predecessor, The Sweetness at the Bottom of the Pie. 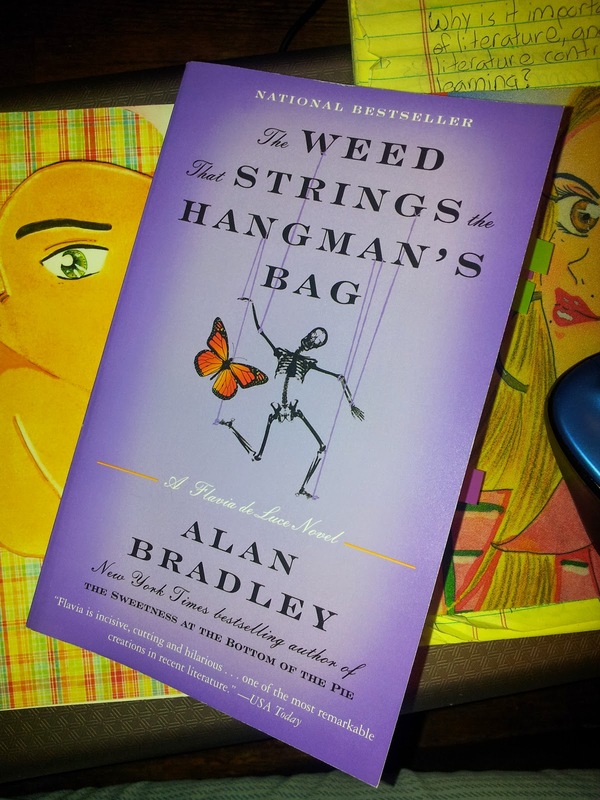 Nevertheless, The Weed That Strings the Hangman’s Bag wasn't exactly thrilling, and yet these are not thrillers. Like the previous books, it's told with a near lethargic, old English style of mystery telling; reminisce something Agatha Christie if you will. The juice, however, is the first-person narrative provided by Flavia (let‘s pun this and say the “flavor“). She’s the juice and the disparity; the life, heart and spirit of the book. So should Bradley throw out the mystery elements, I would probably find satisfaction in Flavia spinning around her English village snooping in residents' business. Or sprinting up to her deceased great-uncle’s chemistry lab to concoct an astringent used to lace her older sisters’ chocolates. Incidentally, this is what took place as the book revved up. You see, the actual murder and investigation elements switch into gear 150 pages deep. That’s right, 150 pages. Therefore, between the first and 150th page, Flavia was more or less moving about without motive. Yet at the end, she had everything nailed down to share with the Inspector. Everything just seemed to come about... right on time for her. So to speak. I'm trying to be vague and throw shade at the same time. Nonetheless, I definitely look forward to the third book.